We breed for health, personality and of course beauty! 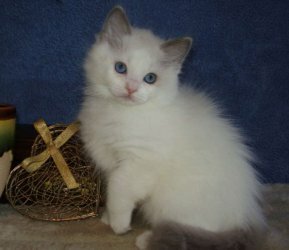 Our Ragdolls have that luxurious and thick coats that match their gorgeous blue eyes. We pamper each litter of kittens and raise them in our home right underfoot. They are so incredibly sweet due to them being constantly socialized with us and our children! We breed for those unique floppy personalities and very docile temperaments. Our kittens are literally our spoiled babies until they are yours ForEver, interested persons should contact us for more information.